If your a fan of KISS, then you probably know that their new album “Sonic Boom” will be sold exclusively at Wal-Mart starting on 10-6-09. Press Pass has created a product that will be sold right next to their new CD/DVD. 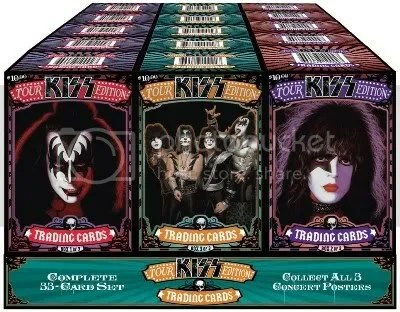 KISS “Tour Edition” is a 33-card set that features a ton of KISS stuff from the last 35 years. There are three collectible boxes and posters. This set should give collectors a great look back at the band. Each set will cost around $10.00 each. KISS is one of those bands that understands the term “merchandising”. 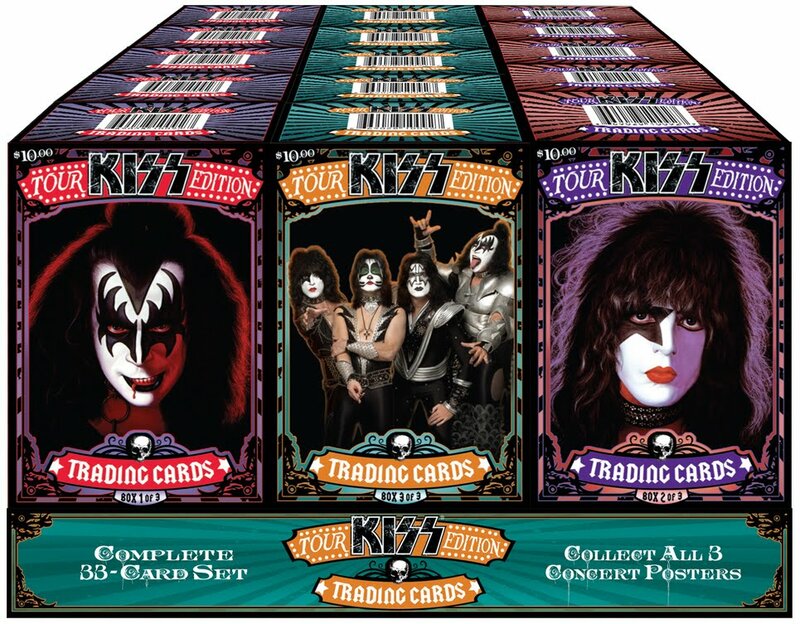 The world is filled with a ton of KISS collectors that will scoop this stuff up. On a side note, maybe this is something other manufacturers should think about doing. A few days ago I wrote a post about how current manufacturers should try and work their way into the video game industry, which sparked quite an interest. If its too costly for a manufacturer to actually get in the game somehow, perhaps they could package some cards with the game. Would anyone be opposed to having a pack of 2009 Topps Football attached to their new copy of Madden? I never know what the UPS guy will drop off at my doorstep. On Friday I got a package from Press Pass which contained a box of their new KISS 360 product. This is the first time I’ve ever opened a product which hasn’t been released yet. Press Pass’s last KISS product Ikons quickly soldout and was a big hit. It wouldn’t surprise me if it happens again with 360. I didn’t know what to expect with a product like this, but I enjoy the design of these cards. Most of the cards feature great photos from the band’s history. There are a ton of rock n’ roll themed borders. My favorite would have to be the borders around the first 9 cards in the set called “UNMASKED”. Each card has volume bars around the edges. Just like with their past Ikons product, there are “Blood Spitting” parallels for each base card which fall 1:4 packs. These feature blood spots on black and white images of the base set and look really cool. Right now boxes are being pre-sold anywhere from $40.00 to $60.00. Considering there are 24 packs with 5 cards in each pack, thats not too bad. You aren’t guaranteed any hits which is probably why its selling within that price range. I’m sure there are collectors out there who have spent much more on a box and didn’t get any hits either. As I said before, your not guaranteed any hits per box. Relics fall about 1:90 packs, and you really need to get lucky if you want to pull an autograph. The “Blood Spitting” parallels seem to be a big hit with collectors based on the Ikons set. The parallels #’ed/50 hold a lot of value for collectors too. I consider it a good box if you pull at least one serial numbered card. It makes sense that the relics and autographs would be hard to pull. Everyone in KISS is a star and it almost makes each hit a really good one. Its not like baseball or football where you have a ton of players. Overall, I give 2009 Press Pass KISS 360 3 out of 5 blood drops (1=poor & 5=perfect). KISS is one of those bands that has done an excellent job of slapping their name on anything. With all the KISS fans in the world I’m sure they’ll have success with this product. I bet it won’t be long until they produce a product with at least 1 relic or autograph in each box on average. I’m glad to see that boxes aren’t selling for huge amounts. You don’t see many products today targeted towards certain bands or people. Usually you’d find band members and other celebrities in products like Americana. If your a fan of KISS, it couldn’t hurt to try a box of 360.